Welcome to the Frictionless Finance Report, our bi-weekly look at everything new in the world of Open Banking, FinTech and consumer experience. If you’d like to receive this in your inbox every other Wednesday, simply fill in the form at the bottom of the page.This week we examine big banks taking a stake in FinTech firms, new surveys into the evolution of Open Banking, and the Canadian Government’s consultation into Open Banking. The New Year is well and truly upon us now as the flurry of news and articles on Open Banking picks up pace. We’re delighted to see several interviews with OBIE’s Imran Gulamhuseinwala and Alan Ainsworth feature this week, alongside several new studies into the uptake of Open Banking, and a plethora of op-eds on how the first twelve months of Open Banking have progressed. In an FT podcast, Trustee of the OBIE, Imran Gulamhuseinwala has spoken on his first twelve months heading up the implementation body. 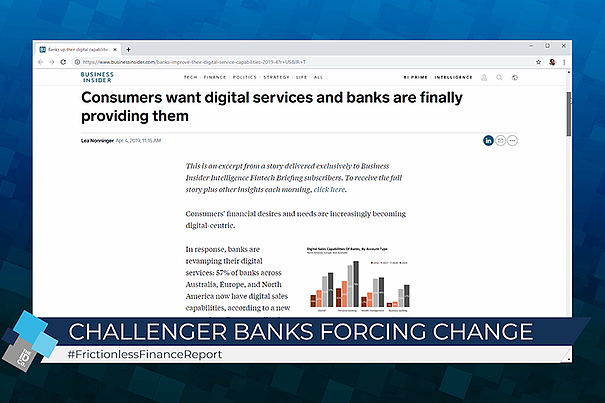 He reiterated the need that exists for Open Banking to thrive, including customers being charged for overdrafts, or have money in current accounts that aren’t earning any interest. He went on to say that the biggest challenge his team has faced to date has been implementation by the big banks. 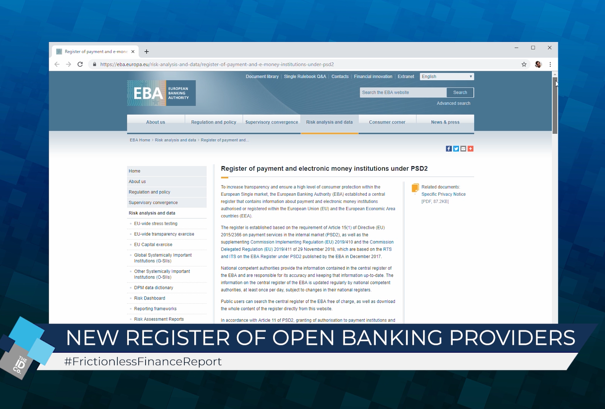 There has been another slew of articles discussing the progress made to date on Open Banking, and looking forward to what 2019 has to offer. Several articles, including FinTech Times, the Herald, Compelo and Verdict focus on digital banks, looking at the likes of Monzo, N26, Atom and Starling as examples of what can be achieved. Indeed, the Fintech Times reports that 8 in 10 millennials say they would switch banks to receive a personalised service. In an op-ed in Finance Derivative, Ian Matthews of NGDATA agrees with most commentators that Open Banking has not yet been the phenomenon that it was once touted to be. However, he notes, that there has been several success stories, particularly in the field of account aggregation, where companies such as Chip and Yolt are making inroads. The final word this week goes to Mike Rymanov, writing in Finextra, who says that until three major challenges are overcome, Open Banking will not succeed. The challenges as he views them are, the lack of acceptance by banks, too much criticism of banks by FinTech’s and the lack of education for the public at large on the benefits Open Banking can provide. International payments, treasury management and foreign-exchange specialist Centtrip have undertaken a new study in to the uptake of Open Banking within medium and large firms. They have found that while adoption has, to date, been slow, 64% of those surveyed said it would save them time, and 58% said it would save them money. Coverage can be found in pymnts.com, Global Banking & Finance, and FinTech Times. In a sign off how far-reaching Open Banking could become, there has been discussion this week of whether banks could begin to offer life insurance through Open Banking, and how it could potentially impact upon the airline industry. And once again, Open Banking has featured in several articles as the technology to watch for, including these in Bobsguide and BM Magazine. We’re back to all systems go this week, as the New Year hangover has well and truly lifted. The biggest news in the Open Banking world this week came from Canada, where the Department of Finance has launched its consultation into Open Banking. With the consultation paper now published (available here), the Canadian Department of Finance is calling for stakeholders to inform it of potential benefits that Open Banking could bring. Coverage can be found across a range of financial services outlets, including Finextra, Banking Tech, Betakit and Digital Finance Analytics. Hong Kong has once again demonstrated it is ready to embrace Open Banking, following a new survey by Accenture. More than half of residents said they would be willing to share data if it meant receiving more personalised banking services. We are witnessing more interest from our cousins across the pond in Open Banking – perhaps because of advancements made in the UK, but also with the progress made by Canada. There have been two articles in the last week that have caught our eye aimed at US audiences, from Bankrate and Wharton. 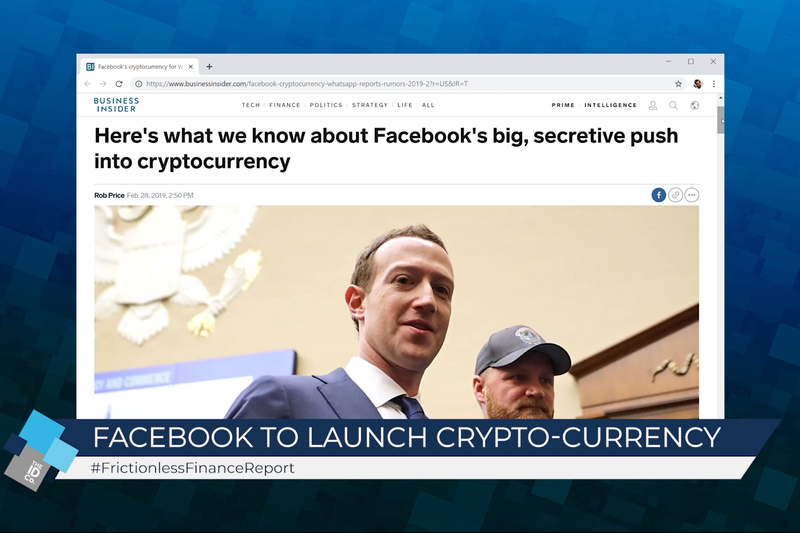 Both have sought to explain Open Banking and Open banking infrastructure to American audiences. We bring a mixed bag from the banking world this week, as we discuss Nutmeg’s latest funding round, the FCA’s new report into high-cost, short term credit, the possibility of Google or Amazon entering the banking world, and customers disposition towards their banking provider. 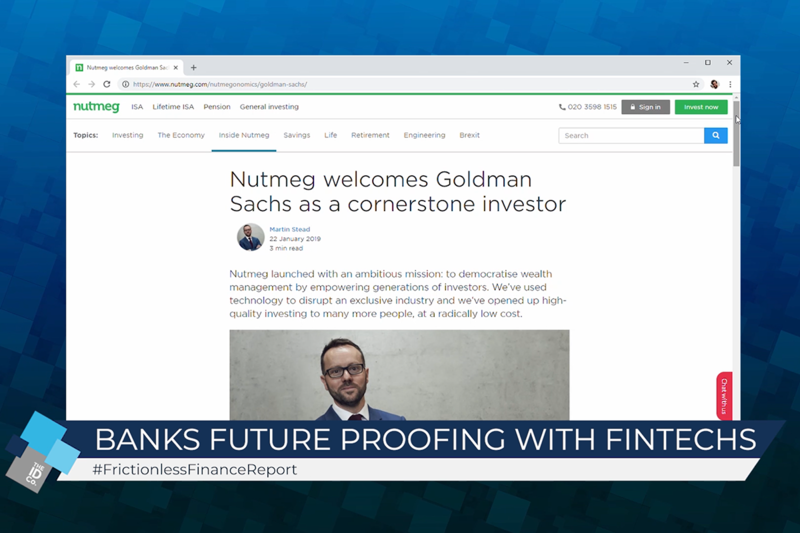 Following a £45m funding round, it has been revealed that one of the largest investments in digital wealth manager Nutmeg has been banking giant Goldman Sachs. The investment has been made via its investment arm, Principal Strategic Investments (PSI). The investment will value Nutmeg at £245m and will continue the US firms move into the UK banking scene following the launch of Marcus in September last year. The news was broken in a blog post from Nutmeg’s CEO, Martin Stead. Further coverage can be found in Sky News, Citywire, Reuters, FT Adviser, FN London, The FT (paywall), City AM and the Telegraph. Last year we at The ID Co. Focused on the subject of affordability for some time around the time of the FCA’s new rules going live on November 1st. This week, the FCA released its new findings on the high-cost short term credit market. They have concluded that while the market is smaller than at its peak in 2013, it has grown since 2016. 10 firms accounted for 85% of all loans accounted for, with borrowers typically paying back around 1.65 the value of the loan. As we’ve covered in detail in previous Reports, the emergence of an Amazon or Google into the domestic banking market is likely to have massive ramifications for both consumers and the traditional banks. In Forbes, contributor Ron Shevlin discusses this possibility, but ultimately concludes that Amazon is far more likely to partner with banks than to try and displace them. A survey undertaken in the US of attitudes towards current accounts have shown that 30% of consumers feel no loyalty at all towards their bank. 10% of those surveyed are planning to switch banks in the next twelve months, with 45% saying finding a cheaper deal was the main motivation. In Finextra, Kirsty Berry has considered how this compares with the UK banking scene. She has concluded that despite only a quarter of consumers feeling valued by their banks, and only 2% consumers switching each year, the main reason for not doing so is a lack of perceived difference between banks. The rise of challengers such as Monzo and Starling are slowly changing this perception however. Korea has markedly stepped up its plans to become a leader in the FinTech scene, after announcing regulatory reforms and the introduction of a FinTech sandbox. The first cohort of companies to be introduced into the sandbox will be welcomed in April following the announcement of $3.5m additional funding. The story has featured in Finextra, Fintech Futures and FS Tech. The subject of talent is never far away when discussing the future of FinTech companies. Charlotte Crosswell, CEO of Innovate Finance, has said that with 42% of UK FinTech's sourcing talent from overseas, the future relationship between the UK and Europe will be key to understanding whether FinTech's will want to set-up, or indeed, remain in the UK. As we related in some detail in the last Frictionless FInance Report, the relationship between traditional financial institutions, challenger banks and FinTech’s is nothing if it is not complex. Altfi have a reasoned piece in which they look at the example of Atom Bank appointing 40% stakeholder Citi Group as advisers and wonder whether this setting a precedent for the large financial institutions to take over their smaller challenger rivals. Similarly, Banking Exchange has examined a number of the larger and better-known challenger banks and FinTech’s and asked the question of what the big banks could learn, and importantly, what does disruption mean in 2019? Finally, we reached an interesting piece that reached our ears courtesy of Entrepreneur. They have written on the rise of the tech sector in France, via an interview with Christophe Lecourtier, CEO of Business France. The investment body, set up by the French Government in 2013, has seen under its remit, the growth of French tech firms to over 10,000, raising more than $3 billion.